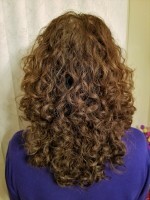 I wanted to treat myself to highlights, and the curlygirl book and boards suggested that balayage is a great technique for curly/wavy hair. Although my hairdresser is highly recommended for Deva haircuts, it didn't occur to me to ask how she was at coloring. I have medium brown hair, and asked for reddish sun-kissed highlights that were lighter at the root and stronger at the ends, so you wouldn't notice them growing out. She swears that's what she did, but I've got brassy copper chunky highlights that are really strong at the top of my head (along the part at the roots) and practically nonexistent more than a couple inches down the hair. Is there any way to fix this? 2b, oily scalp, dry hair, thick (iii), medium texture, medium porosity,low elasticity- prone to canopy frizz! I don't have an answer for you, but my hair sounds almost identical to yours and I'm planning on getting those highlights in 2 weeks. Ack, now I'm scared! Do you mind if I ask where you're located? I would go back to the salon and just let her know that you're not happy with the color. Last time I was there, a girl came into another stylist whose boyfriend was unhappy with the color of the highlights and she was just getting ready to redo them when I left. Thick 2c/3a hair. normal porosity and texture, low elasticity according to Curl Wizard. When my highlights go wrong, I put dye on top by dying my entire head. That has happened to me the few times I got salon highlights too. You can use Color by RC to gently tone down the brassiness, works great for that too. If you can post or send me pics, I can help you find a color that will tone down but not cover them. LMK if you decide to go that route. I'm so sorry to hear that your balayage turned out to look more like highlights. I got my balyage done at the end of April and I love it! Prior to this I had been doing my own box color at home so when my hair was done lifting it went back to the hideous red that I had tried to eliminate with an all over color the day before the balayage technique was applied. when i lifted to that ugly red, my colorist made the perfect mix to make it a better more natural reddish-brown sun kissed look. but as my color faded it did turn a tad bit brassy, but a quick gloss eliminated all that brass! So I suggest that you go back in to have her paint better more consistent pieces throughout and then gloss you to eliminate the brass. If you're ever in Washington State, visit one of the Gene Juarez Salons, that's where I got mine done. It's a chain of 5 star salons and spas up here that make sure their artist are properly trained and continually trained so you will definitely gonna come out looking the way you want! Plus they have a pretty open re-do policy! That was a little over a year ago, but what I did was wash my hair several times with Head and Shoulders shampoo, which lifted just enough color to take out the brassiness. It actually grew out pretty nicely after that. The next time I got highlights, I went for a less reddish color, and the effect was so subtle I was disappointed. Go figure.